Early voting opened across Georgia beginning Monday, Oct. 15. 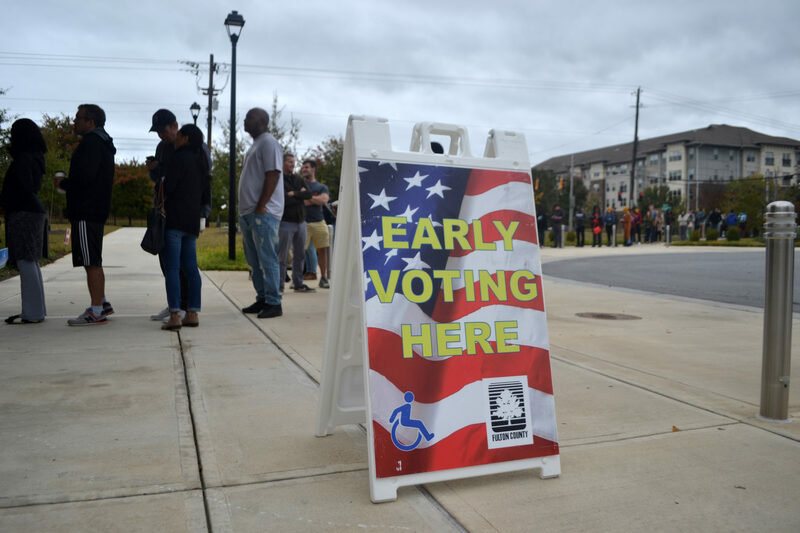 Early voters, bogged down by work, classes or other obligations, could cast a vote between the three-week early voting period before Nov. 6, Election Day. Georgia State, nestled in the heart of Downtown, houses a diverse student body. Despite that diversity, many hold similar views as their peers, pledging allegiance to their Democratic nominees. Many also champion voter registration, realizing the importance of civic duty. The Signal conducted a survey pulling from 50 Georgia State students in Library Plaza on Oct. 29 in the morning and early afternoon. After weeks of advertisements, celebrities, friends, family and volunteers hounding students to register to vote, the results for voter registration skyrocketed. Of the 50 surveyed, a whopping 46 Georgia State students said they’ve registered to vote. For some Georgia State students like Caroline Pena, it will be their very first time voting. And some students were voting for their first time in America. Nearly all surveyed students were registered to vote, but most were saving their vote for a later date. Ten of 50 surveyed students voted early. Georgia State students have their excuses, a skill college students learn early. “I haven’t had the time. I’ve been busy,” Lamiyah Mussaji, a senior at Georgia State, said. Georgia State, a notorious commuter college, inflicts the extra strain of commuting on students’ schedules along with traditional school work. Despite the absentee ballot, some students still aim to reach a physical voting poll. “I have to vote in Kennesaw, so I have to do a little road trip,” Jordan Gruss said. Convenience beckons the early Georgia State voter, as those who did vote early did so for practicality. Daanish Badruddin, a junior at Georgia State, said “less lines” kick-started his early visit to the polls. Angela Chude, a sophomore at Georgia State, echoed Badruddin’s reasoning. “I know everyone’s going to be out at the polls,” Chude said. Many Georgia State students vote for the first time this voting cycle. Only three of 50 said they had voted in the previous voting cycle — an enormous disparity compared to how many students have registered this election cycle. This election caught some students’ attention because of the current administration’s stance on immigration. Angela Castanza, a sophomore at Georgia State, said she voted because of her parents. “They’re immigrants, so I was motivated to help them in the state we’re in right now,” Castanza said. Some Georgia State students were motivated solely to keep a certain governor out of office. Anna-Claire Wright cited civic duty as her motivation. “I’ve seen the advertisements for both candidates. It’s a motivation for me to not have a certain type of person as my governor from what I’ve seen in the advertisements,” Wright said. Several voters’ families motivated them to vote — even if they weren’t planning on it. “Honestly, my parents said we’re going to go vote today,” Dyanna Hodge, a junior Georgia State student, said. Other students’ family’s words counted as enough motivation. “My aunt told me your vote counts,” Temaj Ahmed, a freshman Georgia State student, said. Georgia State students’ major issues of concern ranged from gun control to Marsy’s Law. Yet, the majority of students’ concerns lay with immigration and the representative’s party allegiance. Salazar protested Kemp’s advertisements and flair politics regarding his anti-immigration advertisements. Representative party alignment usually followed after immigration. Joy Stanton-Hirst, a freshman Georgia State student, said she wanted more democratic influence in the House. Daanish Badruddin said he wanted Democrats in the office and not a Republican. None of the 50 Georgia State students surveyed supported a Republican candidate. Gun control remained at the forefront of many Georgia State students’ minds, possibly because of the recent Campus Carry law. “I’m worried about my safety,” Jennifer Javetz, a junior Georgia State student said on gun control. Marsy’s Law has also received a lot of attention in wake of the #MeToo Movement. “Women should have their own voice,” said Moaaz Nasir, a sophomore Georgia State student. “[Sexual misconduct] shouldn’t just be treated as a regular crime. Women’s rights, namely abortion, shaped some Georgia State voters’ decisions. With Election Day approaching, Georgia State will witness changing legislation due to the votes students will — or won’t — cast.